Get 71 years of the Gun Digest annual book in PDF format on 3 DVDs. Spanning everything from classic hunting guns, competition guns, and concealed carry guns, to tactical guns, military guns and more, this collection makes the perfect gift for any gun owner! 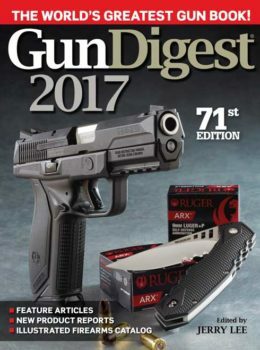 Get all 71 years of the Gun Digest annual with Gun Digest 1944-2015 3-Disc Set – that’s over 3,000 gun articles in this historic collection! Not only will you find information on classic guns from classic gun writers, but the information included spans to current developments in the firearm industry, as well. While more recent editions may be easier to find, many of the older ones are out of print, very rare, and difficult to find, so with this exclusive collection you can get all of them in one convenient format without having to hunt them down. With this expansive collection, get gun industry news and in-depth history on manufacturers and the people who shaped the industry. Whether you have an interest in guns for hunting, competitions, concealed carry, or another function, you’re sure to find plenty of articles that suit your interests.